The stars of Draco the Dragon, wind through the picture. North is to the left. Vega, in Lyra, is at the lower right corner, Hercules at center right, Bootes at upper right, while the bowl of the Little Dipper is at center left and Cepheus at lower left. Draco's squarish head is just below center, its two bright stars Rastaban (Beta) on top, Eltanin (Gamma) on the bottom. Kuma (Nu) is to the left of Rastaban. Proceeding to the left and a bit down is Altais (Delta) and Epsilon. Sigma is between the two. Zeta is up and to the left of Kuma, Al Dhibain (Eta) up and to the right of Zeta. We then go up and to the right to find Theta. Kappa Dra lies in the upper left corner. 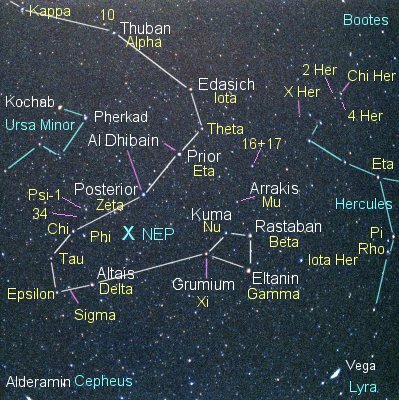 Then look to the right and somewhat down to find a pair of stars, the lower of which is famed Thuban (Alpha). Edasich (Iota) is then down and to the right of Thuban. Kappa is flanked by 4 (on top) and 6 (bottom) Draconis. Draco then continues up and to the left to the Dragon's tail at its far western end and Giauser (Lambda). The North Ecliptic Pole (NEP) is about three-fifths of the way from Delta to Zeta. The South Ecliptic Pole is in Dorado.